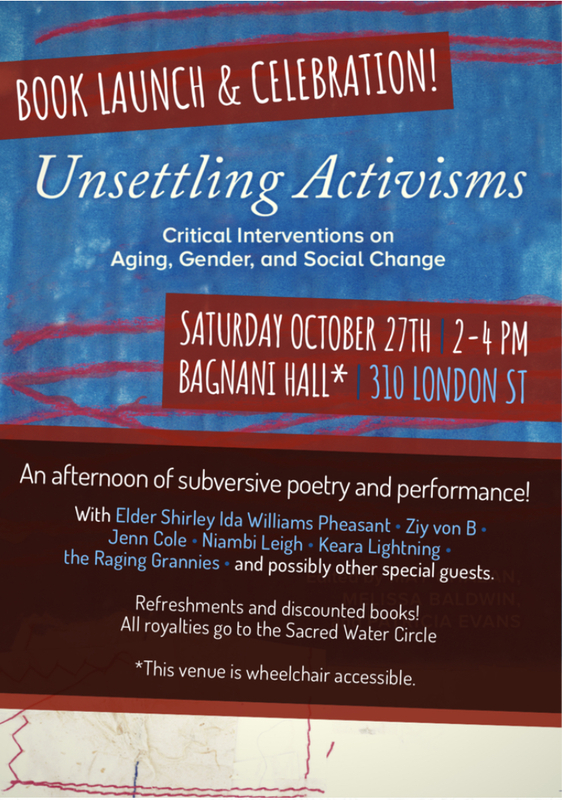 Unsettling Activisms: Critical Interventions on Aging, Gender, and Social Change – (co-edited by May Chazan, Melissa Baldwin and Patricia Evans), is now available! Unsettling Activisms has been in the works since late 2015. The project has entailed ongoing storytelling and relationship-building, poetry, life writing, orality, photography, performance, and research – all with the aim of challenging and extending dominant ways of understanding both activisms and aging. (Traill College, 310 London St, Peterborough, Ontario). 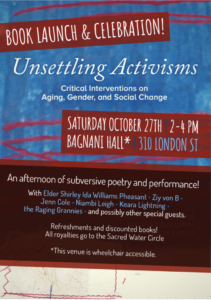 All are welcome to join an afternoon of subversive poetry and performance, and delicious snacks.